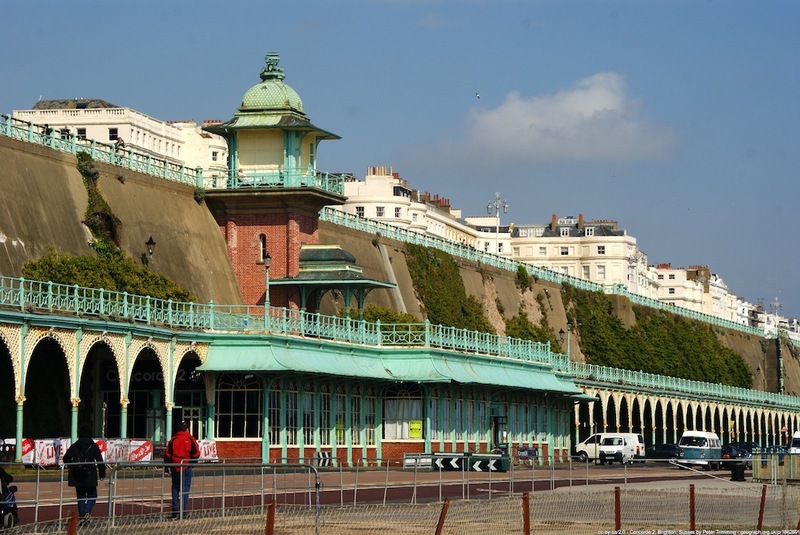 Madeira Drive and Terrace, taken from the south-west, showing the terrace above and the three-stage life. 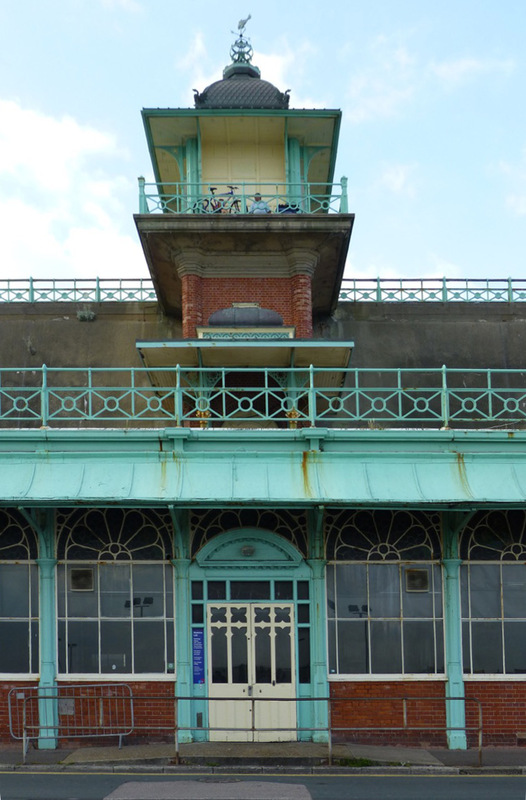 Left to right: (a) Close-up of the lift to and from the Terrace, © David Lally. (b) Close-up of the pierced ironwork on the arches, with Neptune's head at the centre, © Nick MacNeill (alternate arches have a female head, perhaps that of Venus). (d) Beyond Madeira Drive, a gradient linking the road to the Lower Esplanade west of Brighton Pier. Although "hundreds" of arches seems to be an exaggeration, from start to finish it was a costly and ambitious project, seen by some as a tremendous addition to the town's attractions, but by others as spoiling the natural scenic splendour of the seafront (see Dobraszczyk 365). Nowadays, it has the patina of history and there has been a great and, fortunately in view of its uniqueness, successful drive to restore it. Parallel to Marine Drive runs a narrow gauge heritage electric railway, built by the German inventor and Brighton resident Magnus Volk (1851-1937). The first section was completed in August 1883: it was Britain's first public electric railway (see Antram and Morrice 131). Its recent revival makes it the oldest operating electric railway in the world ("History"). 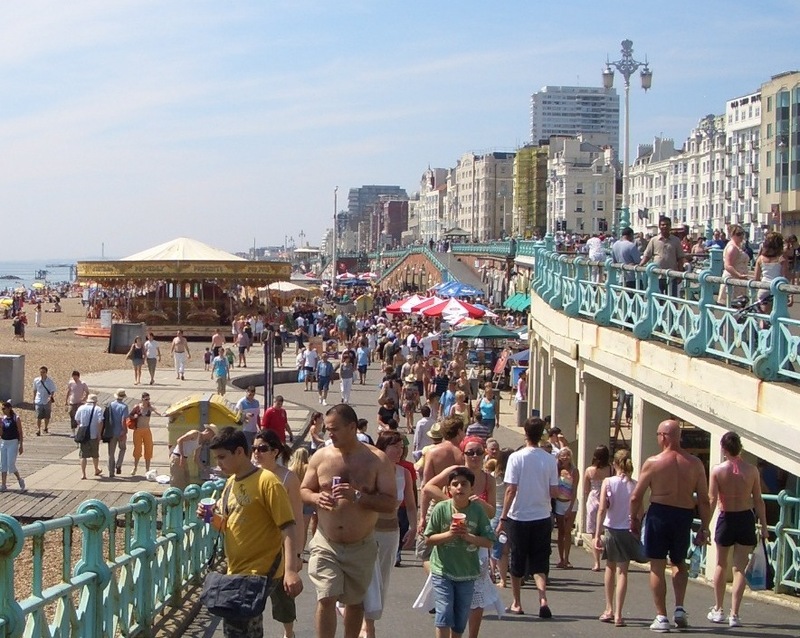 As can be seen, looking west, the seafront structure along the rest of the beach is complex, with further points of access. 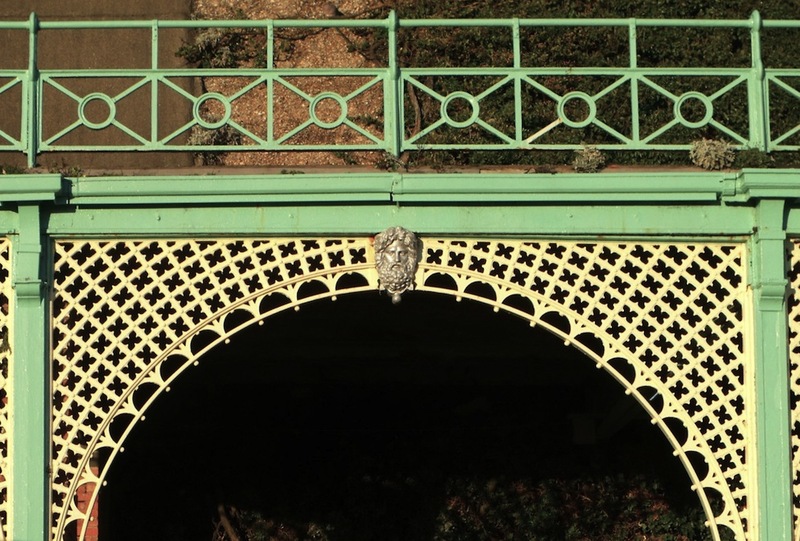 The Upper Esplanade, raised on the red brick vaults, was created by Lockwood in 1885-87, and the railings and shelters date to this time, though the ornate lampposts were added in 1893. These were executed by the Macfarlane Company in Glasgow. The ironwork again makes a very striking contribution to the scene. 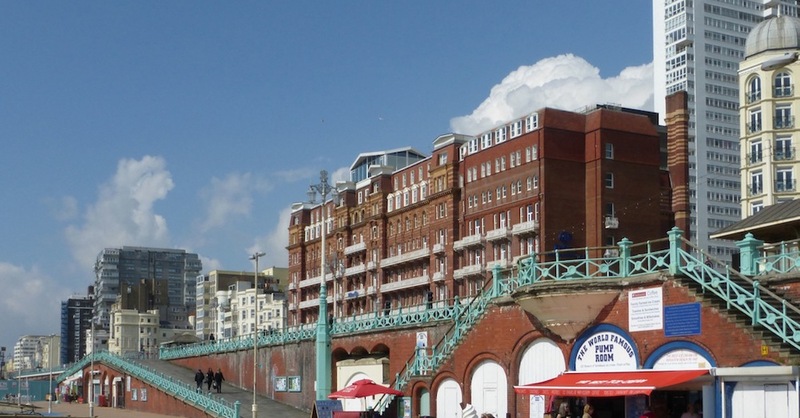 The large building above the seafront here is Alfred Waterhouse's Hotel Metropole. Last two photographs, and text, by Jacqueline Banerjee. You may use these images without prior permission for any scholarly or educational purpose as long as you (1) credit the photographer and (2) link your document to this URL in a web document or cite the Victorian Web in a print one. The other photographs, individually identified, were originally contributed to the Geograph Project, and can be reused under terms of this Creative Commons Licence. They have been slightly modified here. "History." Volks Electric Railway. Web. 29 April 2018. "Madeira Terrace and Madeira Drive." Brighton and Hove City Council. Web. 29 April 2018. "Madeira Terrace, Madeira Walk, Lift Tower and related buildings." Historic England. Web. 29 April 2018. "Save Madeira Terrace Crowdfunding FAQS." Brighton and Hove City Council. Web. 29 April 2018. "Timeline — Madeira Drive through History." building green. Web. 29 April 2018.